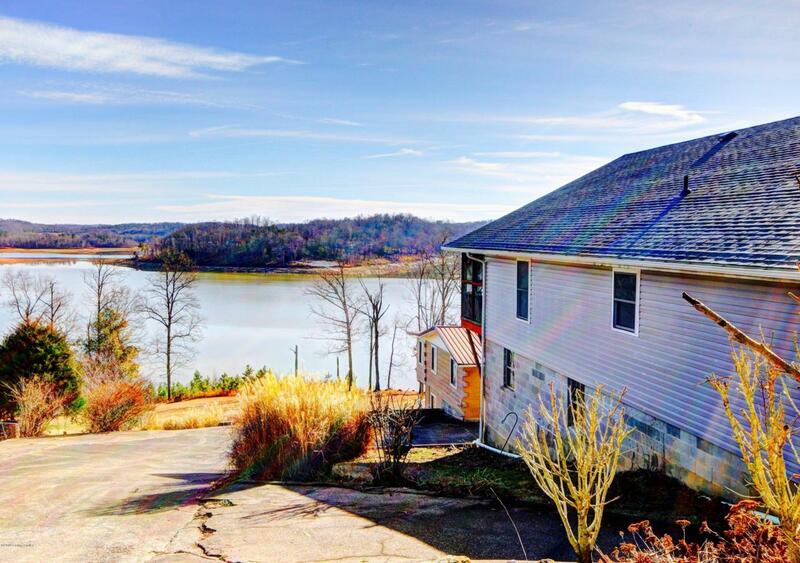 Offering some of the most incredible VIEWS that Nolin River has to offer, this one-of-a-kind LAKEFRONT property has everything for your recreational enjoyment. DOCK and boat slip at the end of the cleared, gently sloping (3 lot total) property, is transferrable with purchase. Not to mention, you get 2 HOMES for the price of 1! The main residence has 3 bedrooms, with an additional room in the basement currently used as a fourth bedroom, and 2.5 baths. The first level is completed with a living room and eat-in-kitchen offering scenic views of the lake from every angle. Step out onto the screened balcony, spanning the width of the home, to hear and watch the boats drive by. New roof, siding, and gutters on main home as of December, 2018.Below the lower level is an 1800+ square foot garage with 20' overhead door perfect for your boat or RV! The original family cabin provides 3 more bedrooms and a bathroom which was used by the family as an overnight guest rental for $142/a day. The views just keep getting better as you step out on the porch from the lower level of the cabin. Step inside for access to the kitchen and family room. The possibilities are endless for vacationing, potential income producing investment, and could be a perfect opportunity for MULTI-FAMILY get-togethers.